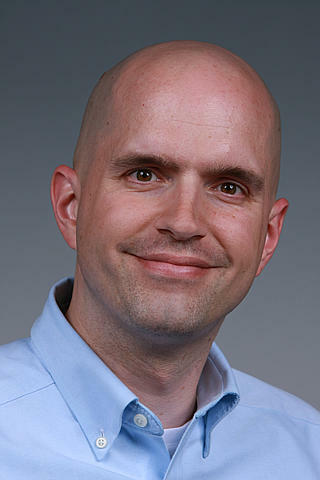 Nathan Baker, Ph.D., is the Director for the Advanced Computing, Mathematics, and Data Division at Pacific Northwest National Laboratory and a Visiting Faculty member in the Brown University Division of Applied Mathematics. His research focuses on developing new algorithms and mathematical methods in biophysics, nanotechnology, and informatics. His research projects include computational methods for modeling solvation in biomolecular systems, mathematical methods for mesoscale materials modeling, and development of methods for signature discovery. His research has been funded by the National Institutes of Health, U.S. Department of Energy, and National Science Foundation. Dr. Baker has served as co-principal investigator and project manager for the DOE Advanced Scientific Computing Research CM4: Collaboratory on Mathematics for Mesoscopic Modeling of Materials and as lead for the Signature Discovery Initiative at PNNL. He also managed the Applied Statistics and Computational Modeling Group at PNNL from 2013 to 2015, which comprised approximately 50 staff with expertise in statistics, mathematics, and operations research. Dr. Baker has served on review panels for various agencies, including as a member of the NIH Macromolecular Structure and Function D study section. He currently is an editorial board member for Biophysical Journal and serves on the editorial board for NPG Scientific Data. Dr. Baker previously served as associate editor for Biophysical Journal, editor-in-chief for Computational Science and Discovery, and section editor for Annual Reports in Computational Chemistry. He has authored more than 100 peer-reviewed publications. Dr. Baker is a Fellow of the American Association for the Advancement of Science and has been awarded the Hewlett-Packard Junior Faculty Excellence Award by the American Chemical Society, the National Cancer Institute caBIG Connecting Collaborators Award, and an Alfred P. Sloan Research Fellowship. He earned his doctorate in physical chemistry from the University of California, San Diego.